NBA – The defending NBA Champion Golden State Warriors scape Game 1 in overtime in 124 – 114 win at home in Oracle, Arena in Oakland, California. Warriors outscored the Cavs in OT, 17 – 7 to take Game 1 and now leads the series 1 – 0. 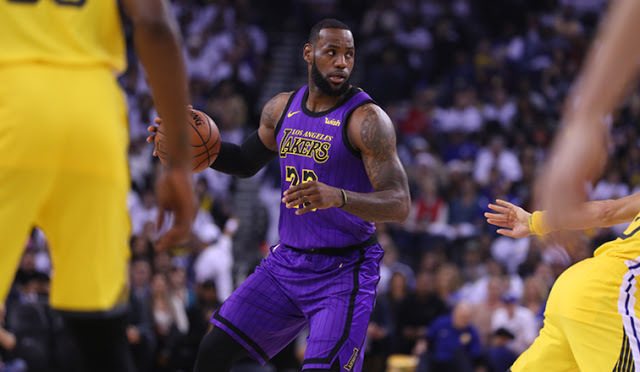 In the 1st quarter, both teams are shooting a high percentage in the field not allowing one another to pull away in the game, LeBron James and Stephen Curry leads their respective team in scoring to end the quarter with one point separations 30 – 29 Cavs by a point. In the 2nd quarter, Cavs able to take the first double digit lead of the game while LeBron James is resting on the bench halfway through the quarter, but the Warriors slowly cut the Cavs lead and able to even the scores at the half with a buzzer beater made by Stephen Curry to tie the game at 56 - all in 16 – 5 run by the Warriors. 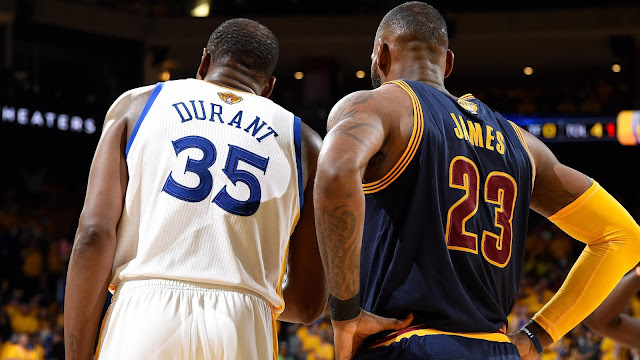 In the 3rd quarter, both teams had a seesaw battle, The Warriors had a quick start regaining the lead in a 10 – 3 run enjoying a 7 point advantage 66 -59 but LeBron James rallies back his team with his own 12 – 2 run to regain the Cavs lead 73 – 70 but the Warriors manage to hang on and regain the lead again in 7 – 0 run 82 – 75 and end the quarter up by 6 points 84 – 78. In the 4th quarter, the Cavs and the Warriors are in tight contention and with 4.7 seconds to go, the game is tied, George Hill missed his second free throws shot that could give the Cavs lead, but either way his teammates JR Smith made a great offensive rebound but thought they are in the lead by 1 points and dribble out the ball that lead to over time. In overtime, The Warriors dominated the Cavs by outscoring by 10 points 17 – 7 to easily win the game in OT 124 – 114. Meanwhile, LeBron James made another huge game posting his career high 51 points of the post season in a losing effort. NBA – The Toronto Raptors host the Cleveland Cavaliers in Game 2 of their best of seven semi – final round of the 2018 NBA Playoffs at Air Canada Centre in Toronto, Ontario. The Raptors are trying to bounce back from a very disappointing loss in Game 1 after leading for almost the entire game but falls down in overtime. While the Cavs are looking to steal another game and take a commanding 2 – 0 lead in the series before going home in Cleveland. In the 1st quarter, the Raptors start the game strong controlling most of the quarter just like in the first game, Kyle Lowry has been big for the Raptors leading his team in scoring while the Cavs led by Kevin Love has much better game today compare to Game 1, Raptors edge Cavs 29 – 26 as the quarter ends. In the 2nd quarter, the Raptors up their lead into 9 points, but the Cavs made a mini run at the later parts of the quarter to cut the Raptors lead in just 2 points 63 – 61 at the half. Raptors guard Kyle Lowry continues his great start finishing the 1st half with 18 points, but already in foul trouble after committing his 3rd fouls. Kevin Love leads the Cavs in scoring with 18 points while LeBron James added 16 points. In the 3rd quarter, Cavs starts the 2nd half strong taking an early mini run of 8 – 0 run to take the lead 69 – 63 up by 6 points. Cavs continue their hot start to post their first double digit lead of the game with 7:50 to go in the quarter. Kevin Love has been great for the Cavs in three quarters, but LeBron James has been huge in the quarter, dropping 15 points to lead the Cavs up by 15 points. Cavs able to outscored the Raptors 37 – 24 in the quarter to finish the 3rd 98 – 87 up by 11 points. In the 4th quarter, Cavs lead balloons to 23 points, the Raptors has no answer on LeBron James hot games finishing with game high 43 points, 14 assist and 8 rebounds along with Kevin Love best game in the post season with 31 points and 11 rebounds. Cavs takes Game 2, 128 – 110 and now had a commanding 2 – 0 lead in the series, stealing 2 games on the road and will have home court advantage in Games 3 and 4 in Cleveland. NBA – Cleveland Cavaliers superstar LeBron James became the youngest NBA players to reach the 31,000 career points during their exiting and trilling end game against the Philadelphia 76ers at Well Fargo Center in Philadelphia, Pennsylvania. James is the seventh NBA player all time to reach the milestone, joining the elite group of fast and former NBA superstar with the likes of Dirk Nowitzki, Wilt Chamberlain, Michael Jordan, Kobe Bryant, Karl Malone and Kareem Abdul-Jabbar. James reaches the milestone after scoring 44 points in a down to wire finish against the 76ers unfortunately, despite his huge game after dropping his season best 18th triple double he missed the crucial free throws that could possibly tie the game and extend to overtime. 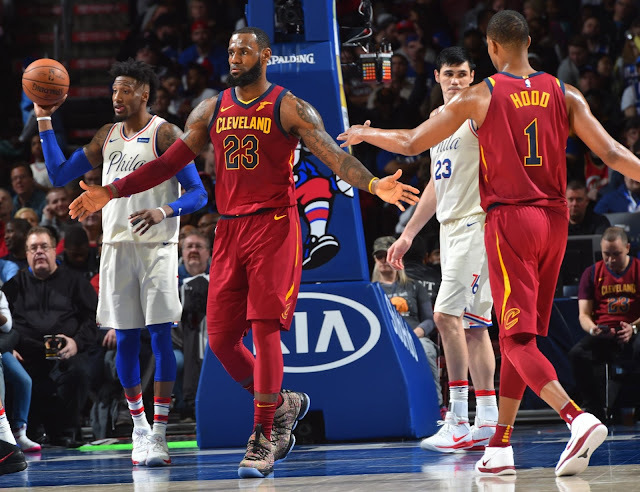 Eventually the Cavs loss the game 130 – 132 and falls down to 4th spot in the East while the 76ers, who won the game are currently holding the 3rd seed in the East. As of now LeBron James remains in 7th place in the NBA All-time Scoring list with 31,002 career points separating by only 185 points to 6th place and only active player in the list the Dallas Mavericks and former MVP Dirk Nowiztki. James is expected to pass Nowiztki this coming games with 6 or more games if James will continue to score 30 plus points per games. Wilt Chamberlain is also in danger of losing his spot to LeBron James with only 417 points separations in their total career points as of now. James is expected to surpass Chamberlain in the 2nd round or possibly in the conference finals of the post season if the Cavaliers are lucky enough to advance? LeBron is more likely to end the season at 5th All- Time in scoring and the next target would be the one and only “GOAT” Michael Jordan at 4th spot and it would happen in the upcoming 2018 – 2019 NBA Season? Meanwhile, prior to this new achievement by LeBron James he recently broke the record of Michael Jordan 866 consecutive games with 10 points or more, James has now 871 double digit points and counting…. NBA – Point Guard Derrick Rose start the 2017 – 2018 NBA Season with a mission of rejuvenating his career after joining forces with LeBron James and the Cleveland Cavaliers in hopes of making his first NBA Finals appearance and NBA Championship? replacement to then injured Isaiah Thomas but again injury humbles Rose that sideline him for 2 months and eventually ended his future with the Cavaliers. On February 8, 2018, Derrick Rose, along with Cavs team mates Iman Shumpert, Channing Frye, Isaiah Thomas, Jae Crowder and Dwyane Wade traded all together on the day of the NBA trade deadline. Rose was sent to Utah Jazz but waived 2 days after the trade. Since Rose becomes a free agent only limited teams are showing interest of assuring him that lead to uncertainty on his NBA career, but his former Chicago Bulls Coach Tom Thibodeau shows interest of recruiting him to join forces once again in Minnesota? On March 8, 2018, The Timberwolves guaranteed Rose a contract for the rest of the season, reuniting with Coach Thibodeau and former Bulls team mates Taj Gibson and Jimmy Butler. Rose and Thibodeau, has been successful during their early years in Chicago as a player and coach, both of them won the prestigious award in 2011 where the Chicago Bulls reach the East Conference Finals but bows down to the Miami Heat. 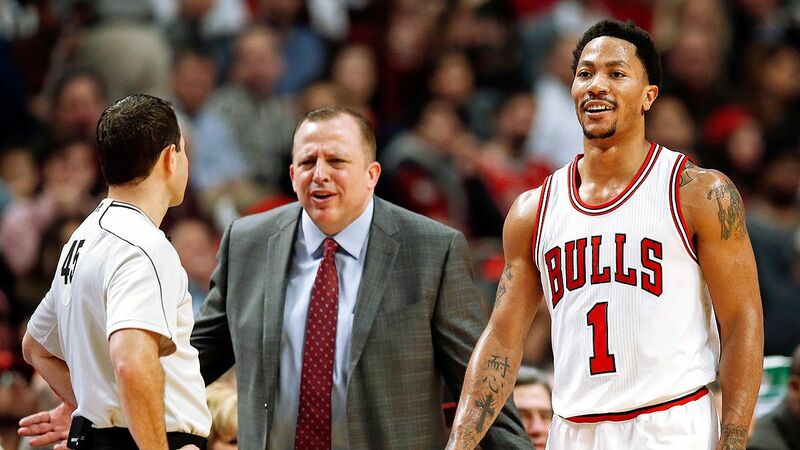 Tom Thibodeau won the 2011 Coach of the year after leading the Bull to 60 wins and 22 losses, while Derrick Rose becomes the youngest NBA Player to win the 2011 NBA MVP Award dethroning the reigning MVP LeBron James. On March 9 (US TIME) Rose was listed to play his first game as a Minnesota Timberwolves against Boston Celtics, but for some reason Rose did not play in the said game. NBA – The Oklahoma City Thunder host the new look and rejuvenated Cleveland Cavaliers in their final match this season at Chesapeake Energy Arena in Oklahoma City, Oklahoma. The Thunder has defeated the Cavaliers in their first meeting in good old fashion blown out win in Cleveland, Ohio. 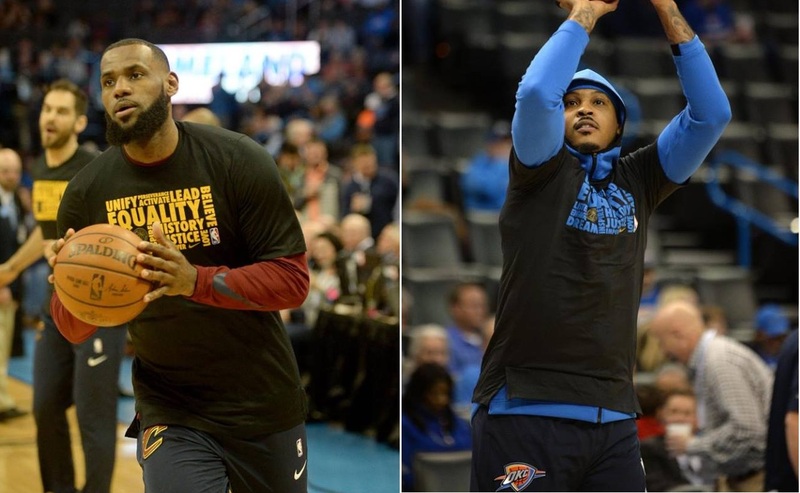 Prior to the game, The Cavaliers are currently 3rd in the East Standing with 33 wins and 22 losses, while the Thunder is 5th in the Western Conference with 32 wins and 25 loss record. The Cavs are on 3 - game winning streak and looks rejuvenated by the addition of new players, especially LeBron James, who seems energized and back to original form from being the best player in the league again while The Thunder is trying to extend their winning streak after defeating the Grizzlies last time out. In the game, both teams came strong in the 1st quarter with several lead changes until the Cavaliers regained the lead in the final second of the early quarter 29 – 28 just up by 1 point. The re - energized LeBron James start strong in the game, leading the Cavs in scoring with 9 points. In the 2nd quarter, the Cavs dominated most part of the quarter with a double digit lead, new Cavs bench player Jordan Clarkson, Rodney Hood and Larry Nance Jr. along with Jeff Green play big while James is resting on the bench. For the Thunder center Steve Adams leads the Thunder in scoring at the half with 15 points and 7 rebounds keeping the Thunder at closed to the Cavaliers to finish the half just down by 5 points 62 – 57 Cavs by 5 points. In the 3rd quarter, Cavs extend their lead again to double digit after their main man LeBron James gets hot scoring the last 15 points of the Cavaliers, but Melo and the Thunder had their own mini run to regain the lead 82 – 81 after Steve Adams made 3 out of 6 consecutive free throws but the Cavaliers still manage to finish the quarter up by 4 points 91 – 87. 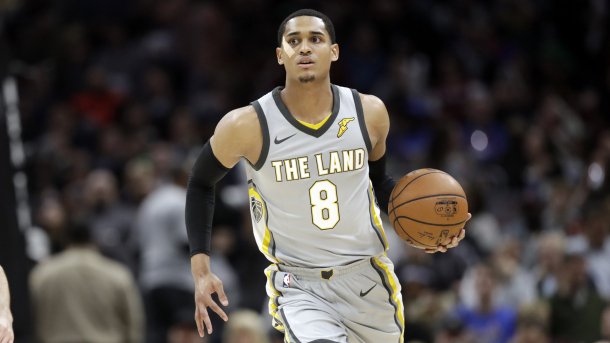 In the 4th quarter, the new Cavs player, Clarkson, Hood and Nance join forces along with Green to up their lead back to double digit 100 – 89 with 8:27 to go while LeBron James is resting on the bench. When James return, still the Cavs bench players that are keeping the Thunder away from the game and eventually won their 4th straight game in a 120 – 112 win over the Thunder. James finishes the game with a game high 37 points, 8 rebounds and 8 assist, JR Smith with another good shooting night finished with 18 points, Jeff Green with 10 points while the 4 new faces Clarkson, Hood, Nance and Gill added big with 14 points, 14 points, 13 points and 7 points respectively.